Sprout. : Swiss Chard Paninis, A New Book, and Why You Should Boil Stuff. Swiss Chard Paninis, A New Book, and Why You Should Boil Stuff. I have been reading the book Everlasting Grace: Cooking with Economy and Grace by Tamar Adler. Adler trained under Alice Waters at Chez Panisse. Those of you that are not familiar with Alice Waters, she sort of pioneered the whole farm-to-table movement. She did it before it was cool, and since then has been helping to promote local, sustainable cuisine with a number of different projects. Most notabley, her Edible Schoolyard project brings agrictultural education into the classroom, and I think it's fantastic. One of her many prodigies, Adler writes about vegetables in a way I can only aspire to. In her book, she promotes simplicity and quality ingredients over all. One of her favorite ways to prepare many foods is to simply boil it to its perfect point. Boiling? I haven't boiled a vegetable since I was served mushy, tasteless broccoli in my youth. Why would I do that when I can roast? Saute? She notes that it had become a bit out of fashion to do so, but explains that when done correctly, boiling can enhance the natural flavor and texture of the vegetable yet allow it to be itself. So while reading this book, I have started to boil all my vegetables. I have enjoyed the simplicity of this, and most of all, I have enjoyed using one pot to do a day's worth of cooking. I don't even change the water. As she suggests, I just make sure I cook the starchiest last, and in doing so, I flavor the cooking water itself. I have found most success with this cooking method in the use of greens. I boil them in salted water for about 1 minute and then drain thoroughly to prevent overcooking. Then, I drizzle them lightly (or heavily depending on my mood) in good olive oil, salt and pepper. If I want something more naughty, I grate some Parmesan over top. Then I am done. I love this on toast as significant snack or even a light lunch. I don't have a source for local, free range eggs, but if I did, I might be tempted to poach an egg over this concoction for a complete meal. I encourage you to do two things. First, read this book. It is beautiful, and written in a way that few cookbooks are: as a narrative. The stories, recipes, and techniques are intertwined to weave a tail of taste and texture. Second, revisit the saucepan and dare to boil your food. You may be surprised, as I have been, what you can create. 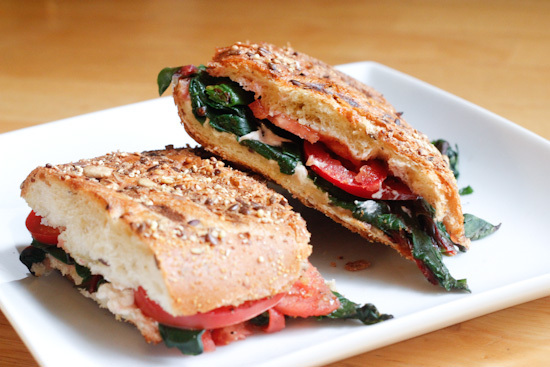 Below is my recipe for a quick weeknight dinner: Swiss Chard Paninis. Again, I am satisfied with the greens themselves on some toast, but if you are looking for something with a little more delicious goodness, this is a great use of those lightly cooked vegetables. I have a panini press, but if you don't, just throw your sandwich in a skillet on medium and place something heavy on top of it (a cast iron skillet works) until golden brown, then flip. Enjoy! 1. Cut baguette into two equal halves. Slice each in half horizontally to create a top and bottom for your sandwich. 2. Spread the bottom half of the bread with goat cheese. On top of that, place a thick layer of boiled swiss chard, then sliced tomato. Season tomatoes liberally with salt and pepper. 3. Drizzle olive oil on the inside of the top half of the baguette and put sandwich together. Press slightly. 4. Grill in panini maker or skillet for 4-6 minutes. Serve hot. It's Asparagus Season - AHHHHH.